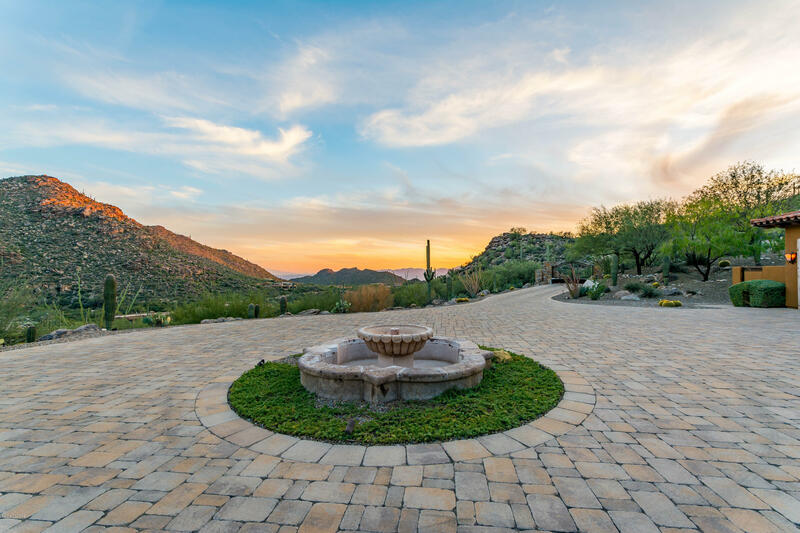 Stunning custom masterpiece in luxury guard-gated Canyon Pass at Dove Mountain. A true secluded oasis. Home boasts the finest of finishes which include: custom wood beams, Canterra stone, brickwork, arches, walnut doors & trim, wine room, hand painted tiles,custom marble & limestone, home automation, first class theater room w/media chairs & scene lighting, exquisite custom cabinetry, dome & barrel ceilings, patios & courtyards w/cut stone, multiple water features, outdoor kitchen, 16' wide opening glass doors from great room to outdoor living sanctuary backyard, massive circle driveway w/private electronic gated entry gate, massive home gym w/aerobic floor area, wet steam room, walls of view windows. Gym is located adjacent to the pool/spa. Garage is extra deep & air conditioned. Directions - From Tangerine, N on Dove Mountain Blvd., East on Dove Canyon Pass to guard gate. Follow Dove Canyon Pass to Left on Soaring Dove.